the news once a month, please click here. CAMaster is a US-based manufacturer of fully integrated CNC routers, and will be exhibiting at IWF in booth 7713. 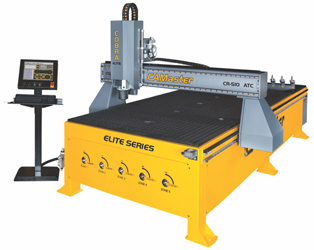 The company's Cobra Elite router is an industrial grade machine that's designed for high production environments. It offers the most innovative and advanced CNC technology in its class, including a digital AC servo drive system, 10:1 precision planetary gearboxes and a unique Z-Axis assembly that provides both high efficiency and high service life. It includes an automatic tool changer, extended gantry heights, drill banks, vacuum tables, vacuum pod systems, aggregate heads, knives and much more. With 2,500 ipm rapid traverse speed and 1,500 ipm cut speed, it drastically expands production capabilities and lowers production time. CAMaster's Panther will also be on display and that is a full production machine designed for mid-size businesses. It has many options available, including an automatic tool changer, vacuum tables, knives and much more. Rockler Woodworking and Hardware, in partnership with The Modern Maker Podcast, has just announced winners of its Plywood Challenge. Participants were asked to make something using one sheet of plywood, any type, and to then post their entry on Instagram. 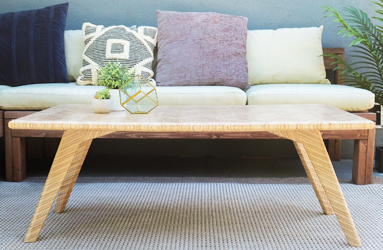 The top three winners were Modern Coffee Table by OSODIY (shown, click on image for larger version), Bentwood Chair by Sami_Chi and Standup Paddleboard by PC_Makes. Chris Salomone, Mike Montgomery of Modern Builds and Ben Uyeda of HomeMade Modern judged the entries. Chris Salomone summed up the judges' comments this way: "I think I speak for Mike and Ben when I say we were absolutely floored by the quality and the quantity of participation that this challenge garnered. And when I think about the thought and execution that went into some of these projects, it blows my mind." Armor Tool in Phoenix, Arizona has just posted a couple of very short videos showing how its inline clamp stacks up against a couple of competitors. The company's product line includes 1-1/2" thick butcherblock maple worktables that are drilled in a set pattern to receive both vertical and horizontal clamps. Also available are clamps, fences and accessories. Together, they deliver an extremely versatile clamping system for both handwork (planing, scraping etc. ), and machining with sanders, routers, pin nailers and other portable power tools. Pressure on the clamps (the inline version is shown here) is adjustable for working with various materials and set-ups. And the faces have a notch so they can be used to assemble mitered projects such as picture frames. The Pennsylvania Chapter of the American Research Center in Egypt will sponsor a lecture this fall on Ancient Egyptian Furniture, which is subtitled "from the earliest examples to those wonderful things of the New Kingdom". Dr. Geoffrey Killen will present the lecture in Anthropology Classroom 345 at the Penn Museum (3260 South Street) in Philadelphia on Saturday, October 20th at 3:30 PM. The abstract for the presentation reads: "More is known about furniture and its development in Egypt than anywhere else in the Ancient World. Bedframes were the first large constructional pieces of furniture to be manufactured and many fine examples were excavated in the 1st Dynasty cemetery at Tarkhan. By the beginning of the Old Kingdom, improved cutting tools and the use of better quality timber witness advances in the manufacture of furniture. These improvements in furniture design and construction can be seen in a series of wall paintings that were discovered in the mastaba tomb of Hesyra at Saqqara and in the reconstructed royal furniture of Queen Hetepheres I at Giza. By the New Kingdom, some of the finest examples of ancient woodworking can be found. Comparing the furniture deposited in the tomb of the workman Sennedjem with the royal deposit discovered in the tomb of Tutankhamun, we can assess the differences in the quality, form and construction of furniture manufactured during the New Kingdom". The list of 2018 finalists for the IWF Challengers Distinguished Achievement Award® is now viewable on the show's website. The award recognizes outstanding companies that have developed innovative technology in products, services, or manufacturing techniques that will advance the industry. There were seventy-two entrants this year, and their efforts were appraised by a panel of ten judges who represent a broad cross-section of the industry. Finalists will perform live demonstrations for the panel of judges, who will then make their final decisions on the most innovative product development. The finalists will be on display in The Challengers Award Gallery throughout the duration of the show in Atlanta. Winners will be announced at 11:00 AM on Wednesday, August 22. The purpose of the Award is to encourage and promote the development of new technology in the fields of woodworking machinery, supplies and services for the furniture, kitchen cabinets, architectural woodwork, store fixture, upholstery and specialty and general wood product industries. IMA Schelling Group USA will introduce several new machines at IWF in Atlanta. 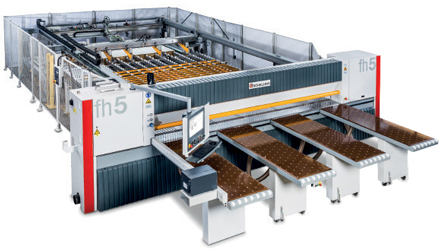 Schelling’s booth theme is "The Space Where Innovation Meets Automation", a nod to its integration of a CR Onsrud router with a Schelling fh5 panel saw (shown) and vs Area Storage Retrieval System, all of which are connected via Eurosofts' SquareOne MES software. Also new at IWF will be an integration of edgebander and return conveyor, controlled automatically via barcode through SquareOne software. Withe the IMA Novimat Compact R3 edgebander, coiled materials can be applied with PUR glue and the R3's Imalux laser. The Barbaric RTS 02 Return Conveyor automatically back-turns 90 or 180 degrees and requires only one operator to manually insert panels. 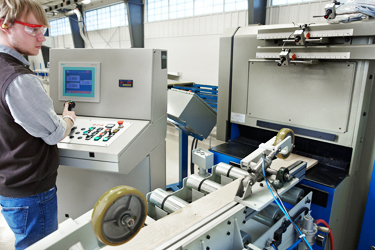 Looking For A CNC Operator? The wood science program at Wisconsin's Northcentral Technical College now uses Alphacam from Vero Software to program CNC routers and to perform design work. Jason Swartz, an adjunct instructor at the college, uses the software both as a teaching tool at the school and also as a production tool in his own shop. The state has strong high-school woodshop programs, many with CNC routers. Building on that, Northcentral now offers students about twenty wood science courses in a 28,000 square-foot technical center that includes 15,000 square feet of manufacturing space. While not every student will become a CNC programmer, the school prepares production supervisors, salespeople and CNC router technicians for the workforce. They’re not just designing boxes, but going through the process of designing the part, selecting tools, nesting, and managing every aspect of production. Tools Today is known for its huge selection of Amana CNC tooling, but the company has now created a YouTube channel with a dedicated playlist that features tutorial videos. 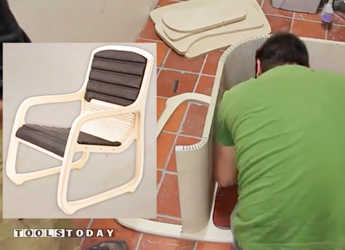 One of the more intriguing is a Kerf Chair that was designed by Boris Goldberg (shown here). Called KerFutel No. 2, it consists of parts that were CNC routed in 18mm thick birch plywood using Amana Tool® industrial router bits. Birch plywood was selected as it is easy to find, affordable and bendable. It's also strong and durable enough for furniture. The upholstery selected was Palfoam™ PA25 by Palziv™, a polyethylene foam with a low density for comfort. The depth of cut for the kerfs was 17mm, leaving the last layer of 1mm plywood to bend so one can make the arched seat. The arms are two sheets of plywood glued together for a total of 36mm thick. Lockdowel has introduced a new Double Headed Pin - a simple solution for fastening flat panels back to back, or to a flat surface or ceiling. It inserts into housings, and when attached the bond holds 100 to 110 pounds. It requires no extra hardware, can be installed by hand and works with a variety of thicknesses of wood, MDF, particleboard and melamine. It was originally designed for panel to wall applications, but in the process the company discovered that it was perfect for signage. 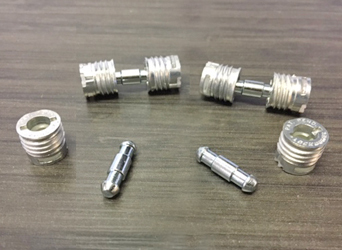 Fred Koelling, the company's CEO says that this fastener is easy to work with, and can be inserted almost anywhere. 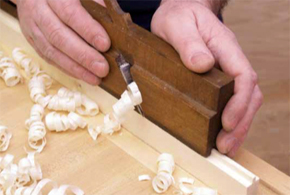 Lockdowel Simple Solutions, including the new Double Headed Pin, will be demonstrated at the company's booth (8073) during the International Woodworking Fair (IWF) from August 22 to 24 in Atlanta. Mark Strahler at Harvey Industries, Ltd. has confirmed for WoodEzine that the company is acquiring Bridge City Tool Works of Portland, Oregon. 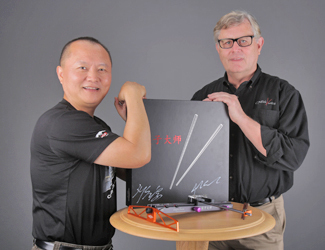 Shown here are Jack Xu of Harvey Industries and John Economaki of Bridge City Tool Works. John founded Bridge City in 1983 and the iconic designer of woodworking hand tools has decided it's time to step down and hand over the reins to his friend and licensing partner. The good news for passionate customers of Bridge City is that they’ll hardly notice a change. Under a licensing agreement that went into effect several years ago, Harvey has been building more than two dozen Bridge City tools for international distribution. That includes everything from try squares to planes to the award-winning Chopstick Master. Jack and John first met in 2013, and quickly realized they shared a common set of beliefs and values. Both view their companies as vehicles to express new ideas and concepts, using tools as a canvas. Nothing says Mid-Century like the iconic hairpin leg, which was invented by Harry P. Glass in 1941 as a response to raw material shortages during the war. The leg has now been redisgned by Brown Wood Inc. to fit today's aesthetic. They have taken the typical round rods and replaced them with rectangular ones, and attached them to a 1-1/2" steel tubular base. 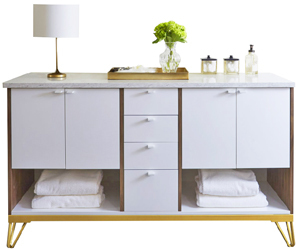 The resulting gold metal base for freestanding cabinets is available in two heights, 6 and 9 inches (SKUs 01BS6213035GL1 and 01BS9213035GL1). The latter is ADA compliant. Depths are 21" and 24", and the bases come in 30, 36, 48, 60 and 72 inch widths. In addition to gold, they're also available in gunmetal gray, raw steel, satin nickel and wrought iron finishes. PDF and DWG drawings are downloadable with top, side and end views. Founded in 1927 and FSC certified since 2001, Brown Wood, Inc. is an industry leading strategic partner for woodshops and designers who are seeking cost-effective, high quality wood parts, components and assemblies. 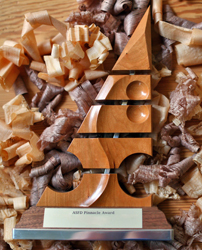 The American Society of Furniture Designers (ASFD) is calling for entries for its 2018 Pinnacle Awards. Designers can enter online and the deadline for submission is July 31st. 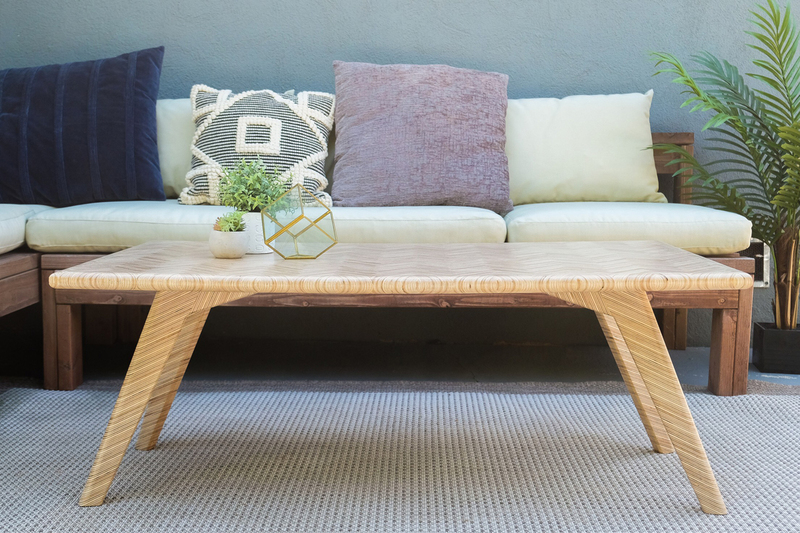 This year's competition has been expanded to include a new category designed to recognize builders/makers who create one-of-a-kind pieces for sale in galleries and stores, as well as client-specific products. ASFD is also acknowledging the growing importance of decorative accessories with three separate classifications - wall, floor and tabletop decor. A People’s Choice Award, which allows retailers to vote on all category finalists, is also new for 2018. Set for October 15th, the 23rd Annual Pinnacle Awards Gala will take place at High Point University and feature a cocktail hour followed by the Awards program, which will feature a high profile keynote speaker from a world class international design studio. 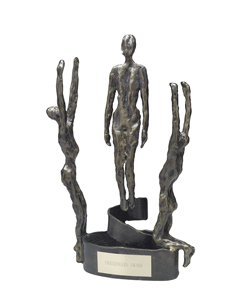 Awards will be presented in twenty-one home furnishings categories. The 2018 Awards are sponsored by the High Point Market Authority, Leggett & Platt, International Market Centers, Designers Today, Continental Hardware, Furniture Today, HSM Solutions, Furniture Design Studios and Sherwin-Williams. 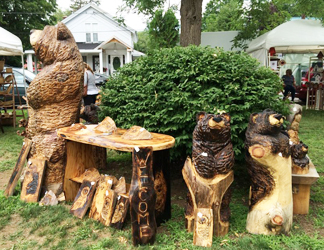 Half an hour north of Schenectady, on the shores of the Great Sacandaga Lake in upstate New York, the village of Northville will celebrate the Rotary’s Tenth Annual Woodworking and Fine Arts Weekend on July 20-22. The event will feature more than sixty accomplished artists from this area and beyond. Woodworkers, jewelers, weavers, potters, photographers, painters and many others artists will display and sell their work at the Bradt Building and Park on Main Street. The weekend begins with a 'Meet the Artists' reception on Friday from 5 to 8 PM. The show will include demonstrations, raffles and a silent auction. Food will be provided by Klippels Kozy Corner. Proceeds from this event will be used throughout the year to provide scholarships to students, support community organizations, and fund projects of Rotary International. 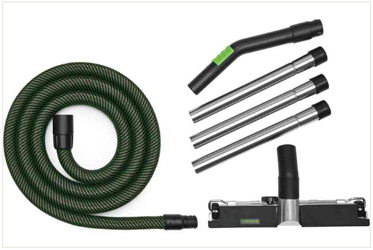 Festool USA has introduced new accessories for its CT Dust Extractors. They include new extension pipes, plus tradesman/installer, workshop, compact and universal cleaning sets. Most of the new accessories feature an anti-static design which prevents dust or particulate accumulation and static discharge. Festool’s entire CT Dust Extractor product line was recently updated with many models featuring Bluetooth® capability for auto start when using cordless tools, remote start at the hose, and new, smooth suction hoses. Many of Festool’s older CT models can be retrofitted with the new line of accessories, including Bluetooth® modules and remote starters. For example, item number 203409 is a Workshop Cleaning Set that's ideal for woodshops and includes a smooth suction hose, an antistatic curved hand tube, a stainless steel extension tube, and an industrial floor nozzle. And staying with Festool, if you own a track saw, you're no longer limited to cutting wood. Festool USA and Festool Canada recently introduced a PCD diamond saw blade for the company's TS55 REQ and TSC 55 REB cordless track saws. The blade was specifically designed and built for cutting gypsum bonded chipboard and fiberboard, common materials which are used for exterior siding and interior substrates. The new blade's features and benefits include cutting with minimal dust, precise results, longevity and durability. The PCD (polycrystalline diamond) blade is engineered and built to provide exceptional service life. 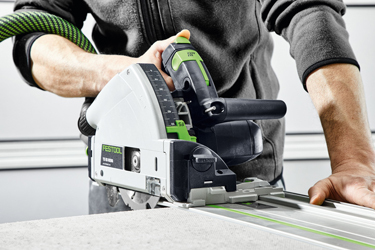 Based in Lebanon, IN, Festool USA offers a comprehensive line-up of power tools and system accessories, designed to boost productivity through efficiency and high performance. The largest woodturning event in the world is taking place in Portland, Oregon on June 14th through the 17th. About 1,200 turners from around the globe will learn, share, and celebrate the art and craft of woodturning. Visitors are invited to enjoy the exhibitions, auctions, and trade show, which are free and open to the public. 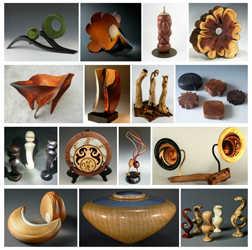 The American Association of Woodturners (AAW), a nonprofit organization dedicated to advancing the art and craft of woodturning worldwide, will host its 32nd Annual International Woodturning Symposium at the Oregon Convention Center, 777 NE Martin Luther King, Jr. Blvd. In addition to educational sessions and demonstrations exclusively for registered conference attendees, the AAW Symposium offers events, which are free and open to the public, that offer a rare glimpse into the world of woodturning. Public events include exhibitions, galleries, and benefit auctions, as well as a trade show jam-packed with the newest woodturning products, tool and lathe manufacturers, and supplies. AAW welcomes the public, all ages, to visit and explore. 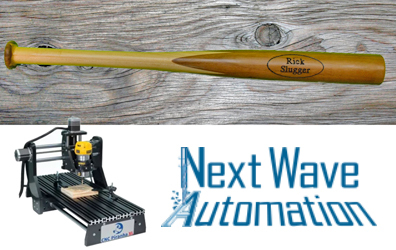 Ohio based Next Wave Automation has just been announced a fun new project for desktop CNC users - a mini baseball bat. The company is offering free instructions and VCarve files, and the mini bat can be customized for any name or team (subject to copyrights). This project is aimed at woodworkers with moderate to intermediate skills, andit can be made using any of Next Wave Automation’s CNC machines. Tim Owens, founder and CEO, said that the company thought this would be a great way to celebrate the new baseball season. The instructions and design files are downloadable. Next Wave Automation manufactures a full line of machines for hobbyists and small wood shops, ranging from the CNC Piranha to the CNC HD4 Extended. The mini bat takes advantage of double-sided machining in Vectric’s new V9 software. Powerful, perfected and expertly designed is how Vesta® Fine Hardware describes its new Ronan collection. 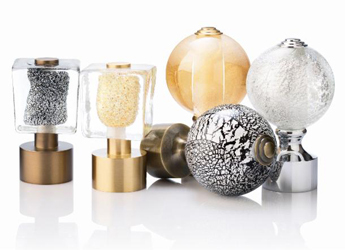 The handcrafted, solid brass pulls and knobs are deeply rooted in industrial heritage but also have an artistic spirit. Each piece in the collection is built to a standard of precision that perfectionists are sure to appreciate. Every curve, cut and corner is expertly crafted for a look that delivers harmony and demands attention. The collection includes seven pulls and two knobs, available in a variety of lengths and sizes, making it easy to use coordinating pieces throughout a project. 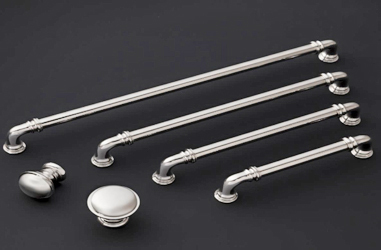 The finishes include Brushed Satin Nickel, Polished Brass, Polished Chrome, Polished Nickel and Unlacquered Brass. Each piece is complete with a lifetime warranty to the original purchaser. 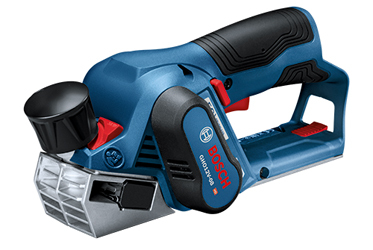 The new Bosch GHO12V-08N is designed for powerful, balanced operation in an easy-to-handle, compact cordless planer. The first 12-volt Max planer on the market, it's about the same size as a hand plane, and the blade is 2.2 inches wide. The tool can handle a single-pass planing depth of up to 0.08 inches. It features an efficient EC Brushless motor for professional operation and smaller size. When planing at 0.04 inches depth in hardwood, this compact powerhouse delivers up to 33 feet of planing per battery Amp hour (Ah). It is designed to provide the easiest planing experience for fast stock removal and smooth finishes. 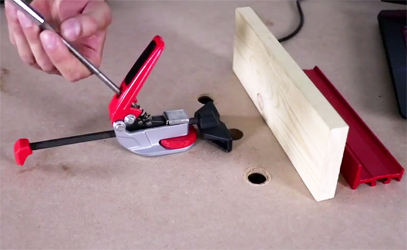 It is ideal for trimming doors because it is cordless, eliminating the possibility of running out of cord in the middle of a planing pass. This is a bare-tool kit; the battery and charger are sold separately. For more information, visit the Bosch website. 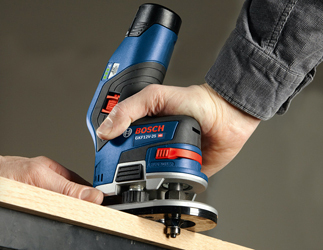 Also from Bosch, the new GKF12V-25 Max Palm Edge Router offers all the power and cordless freedom needed to achieve great routing and trimming results. This lightweight 12V tool is barely 2 lbs. and has an ergonomic offset design that makes it a great choice for comfortable, compact edge routing and trimming. It weighs only 2.2 lbs. (bare tool, no battery). The 12-volt Bosch EC Brushless motor offers impressive 13,000 rpm power and helps to provide great runtime. Constant speed circuitry monitors and maintains speed under load for consistent performance, and restart protection helps prevent accidental startup when switching batteries. The tool provides up to 23 feet of round-over capacity per battery amp hour (Ah). An easy-change spindle lock offers fast macro-depth adjustment and easy fine-depth adjustment. 1. Liability Waiver: woodworking can be dangerous, so before you explore this website, you must first agree that the publishers will not be held responsible in any way whatsoever for any physical injuries, monetary losses, or any other negative consequences of your shop-related activities. Clicking on any of the links signifies your agreement to this liability waiver. 2. All contents of the site are copyrighted by BHSW Inc. It is illegal to share or use any of the content of this website without the owner's written permission. 3. We visit every link on the site (there are now more than three thousand of them) at least once a year. If you come across one that doesn't work, or one that should be here and isn't, we'd really appreciate your letting us know. Read our Terms of Access.